Running a business could be a bit more challenging if you’re a new entrepreneur. No matter the size or industry, there are various aspects of the business you need to learn to focus on and manage for the first time. But thanks to the power of apps or online tools, you can perform different tasks efficiently and connect with your team and target market effectively like a seasoned business owner. Effective communication within the organization is vital. With a tool like Skype, you can easily communicate and stay in touch with your staff, especially those who are working remotely. Download this leading communication app on your desktop or mobile device, and you can chat and conduct conference calls with your team and even your clients, anytime and anywhere. As an entrepreneur, you naturally have a lot on your plate. Keep your to-do-lists, ideas, and projects organized with the help of Evernote. This productivity app is packed with great features to help you remember and focus on the things that matter most. A website is important for your business. It not only introduces your brand, but also builds your credibility. As a relatively new company, you can start with a free basic website using WordPress. With this tool, you can build a professional-looking website that’s guaranteed to attract visitors and boost your online visibility. Organize and track the status of your projects with Trello. This easy-to-use collaboration and project management app helps streamline the workflow. You can even sync the app across all your devices, so you the whole team can get more work done in a fun and flexible way. 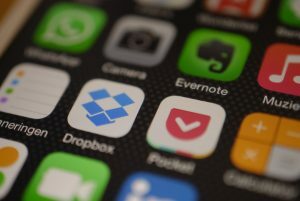 Dropbox is another productivity app that you should consider. A popular choice among more established companies, this app allows you to access and share photos and different types of documents with your team. It is packed with interesting features and can easily be downloaded and installed on your computer and mobile device for effective collaboration and smooth workflow. Social media is a powerful marketing platform, and it would be best for your new business to take advantage of this. Make the most of your marketing efforts with the help of social media publishing and management app, Buffer. With a few simple clicks, this app lets you post content on multiple social media networks. It’s an excellent way to reach a wider audience and increase visibility and engagement. As a new business, you would need to grow your audience through email marketing. MailChimp can help you achieve that goal. With this tool, you can build and manage your mailing lists, create and run email campaigns, and view performance reports. You can even personalize your newsletters by using custom-made templates to make your subscribers happier. Earn your customers’ trust and loyalty by offering them excellent service. Zendesk is the perfect tool to have and use to connect to your customers and give them the best experiences. With this app’s online chat, reports dashboard, and other support services features, you’ll be able to address customer issues quickly and efficiently. It’s important that you monitor and measure the success of your projects or marketing campaigns. In order to do that, take the lead of top business owners and use Google Analytics. With this freemium app and service, you can track website traffic, assess key performance metrics, compare data, build reports, and more. Your company’s financial health is crucial. To organize and keep track of your finances, there’s QuickBooks to make the job easier for you (or your accounting team). This app/software allows you to monitor your sales and expenses and view financial statements. It can be linked to thousands of accounts, including your bank account, credit card, and PayPal, so you can use it to send your employees’ salaries and pay your suppliers. These are just a few of the numerous apps that are great for new entrepreneurs like you. Start using one or more of them to run your business operations more smoothly and productively. Great content! This is helpful to micro and small businesses all over the world.